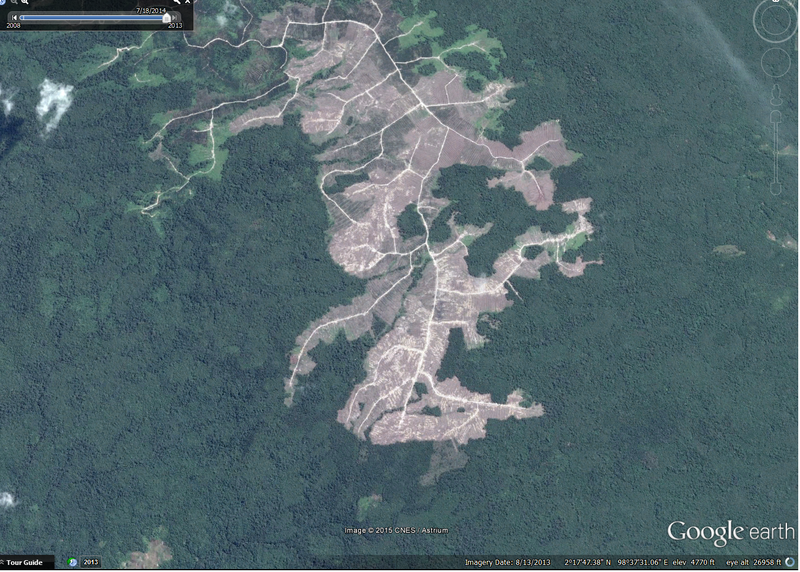 Examples of Deforestation on Google Earth - FreeEconHelp.com, Learning Economics... Solved! There are lots of examples of deforestation occurring around the world and the purpose of this post is to provide some visual examples, using Google Earth, of deforestation occurring in different countries. A lot of deforestation is happening because of timber production, the harvesting of trees to use their wood for inputs in the production of goods such as furniture and houses. Wood is also used as a heating source for cooking or climate control. Forest conversion can also happen because those in charge think that alternate land uses will provide higher profits, or benefits for society (depending on who controls the forest). The following examples look at deforestation occurring in five different controls with a brief hypothesis as to the motivation of the conversion. You can view larger versions of any of the images by clicking on them. The first example occurs in the United States, in the State of California. Timber extraction is tightly regulated in California, so we can guess that forests are being harvested in a sustainable way. An unfortunate side effect of timber harvesting is forest fragmentation which lowers the ecosystem health of the remaining forest and degrades the habitat for animals and other organisms living there. The image on the left was taken in 2004, while the image on the right 2014. We can see that a large area was converted on the left, while individual plots were harvested on the right side of the image. While the effect of timber harvesting is lower by leaving most of the forest intact, forest fragmentation does lower the quality of ecosystems and habitats. The next image comes from Canada. In this example, the first image was taken in 2001, with the second in 2012. While there was some forest fragmentation in 2001, large areas where harvested in this 11 year period resulting in further fragmentation and barren land. Both of these examples occur in developed countries, where we would assume the motivation for harvest to be commercial timber. The next few examples look at developing countries where their could be alternate motives including agriculture, ranching, or even airport development. This example looks at a forested area in China, you can see the obviously converted area. In the recent image, it looks like the local owners have development plans for the area. The image on the right was taken in 2009, the left 2014 meaning that the clear cutting occurred at some point in that five year time period. The next example looks at the Amazon in Brazil. There are numerous examples of deforestation, but this one shows the impacts that roads can have on deforestation as well. (roads lower the transportation cost associated with timber extraction and are a primary motivator of land conversion). The left image was taken in 2009, the right 2011. Over this two year time period thousands of acres of rain forest were converted in this area. Finally, below is a brief example of deforestation occurring in Indonesia. While I cannot include a before/after shot as I did above, we can still see the obvious effects that timber extraction have on the landscape. This image was taken in 2013. Example of deforestation occurring in Indonesia.